Season after season schools and clubs return to us for printed balls. Here at Predator! we offer a full ball design service. Send us your artwork and we can prepare a mock-up for you. Bulk orders can be made up of all three sizes. 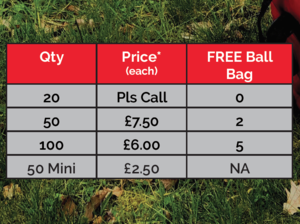 To complement an order of 100 balls, order 50 printed mini balls of the same design for just £2.50 plus VAT. us by May 20th 2019. 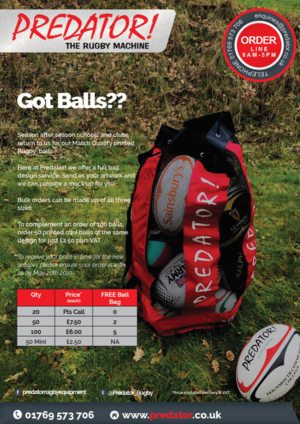 5 FREE BALL BAGS WITH EVERY '100 PRINTED BALLS' ORDER WHEN ORDERED BEFORE MAY 20th 2019. We can print names & logos of club, school, sponsor etc. on Predator! match quality rugby balls. We will email a graphic mock-up of your rugby ball, if required. Additional printing (club name / logo / sponsor etc.) printed on two panels. Express airfreight delivery (2 - 3 weeks) will add £2.00 per ball. 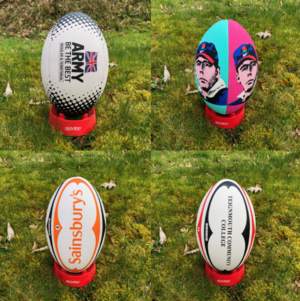 We can also custom print Mini, Midi & Giant Rugby Balls, Soccer Balls, Netballs & Volleyballs. Printed Rugby Balls cannot be ordered on-line. Please telephone 01769-573706 to discuss your requirements. Price displayed is for 100 balls. For lower numbers please call or email for the best price. Price displayed excludes delivery and VAT. We stock completely plain white balls in Size 5 for those wishing to create their own design. Other sizes available to order. PLS CALL OFFICE TO ORDER.